Electric blues that's steeped further in the past than usual. The Spanish conquistador Coronado might seem like an ambitious, and odd, theme for a blues album. Moreland & Arbuckle, though, have shown a historical bent before, even naming one of their albums 1861, after the year their home-state of Kansas joined the union. 7 Cities isn't strictly a concept album from start to finish; not every song is explicitly about Coronado. However, his search for the seven lost cities of gold in what's now Kansas give many of the album's songs a world-weary feel. It's likely something Moreland & Arbuckle can relate to after five albums in six years and the grind of touring. So it's no surprise that 7 Cities opens with "Quivira", named after Coronado's final stop before giving up on his search and turning back towards Mexico. Throughout, 7 Cities finds the group expanding on their sound. They're still drenched in the electric blues of the Mississippi Delta, but over the years they've added more rock flavor, country blues, and even touches of jam band boogie. Dustin Arbuckle's vocals and harmonica still provide a strong companion to Aaron Moreland's slide work (on a variety of guitars, including cigar box models). The band also seems to benefit from the new blood that drummer Kendall Newby brings with him in replacing longtime drummer Brad Horner. Moreland & Arbuckle's signature is a ferocious, distorted blues sound that gains a little more snarl this time around thanks to Matt Bayles' production. Bayles is best-known for producing metal bands like Mastodon and the Sword, so he knows something about keeping guitars at the fore. The album's biggest surprise, and one that's a nice thematic anchor, is the cover of Tears for Fears' "Everybody Wants to Rule the World". Moreland & Arbuckle do a nice job of transforming the song into a mid-tempo blues number without losing the song's chiming familiarity. On an album that keeps returning to themes of greed, the burden of the past and fools' errands, "World" is well-chosen. 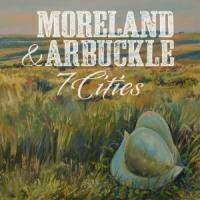 Fans of Moreland & Arbuckle should be very pleased with this album. The higher production values don't seem to sacrifice very much in the way of the band's rough edges, and the band is up to the task of the ambitious theme they've chosen. If there's any change to be found in Moreland & Arbuckle, it may simply be that listeners are less and less able to pigeonhole the band as the party group that their roadhouse-sound implies. 7 Cities is an ambitious record, and like the band's previous efforts, it's also a blast to listen to.